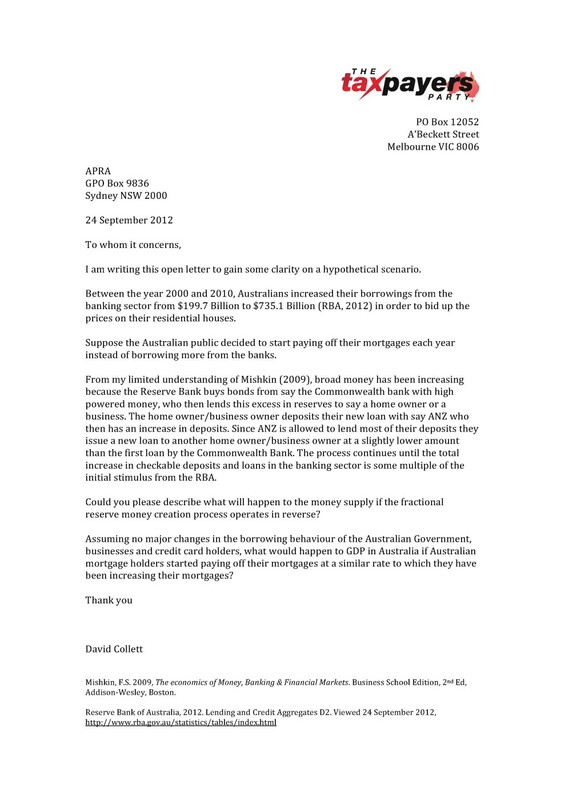 Note: There is an open letter to the RBA on fractional reserve banking, which includes both the response from the RBA and a much more extensive counter argument. I am writing this open letter to gain some clarity on a hypothetical scenario. Between the year 2000 and 2010, Australians increased their borrowings from the banking sector from $199.7 Billion to $735.1 Billion (RBA, 2012) in order to bid up the prices on their residential houses. Suppose the Australian public decided to start paying off their mortgages each year instead of borrowing more from the banks. From my limited understanding of Mishkin (2009), broad money has been increasing because the Reserve Bank buys bonds from say the Commonwealth bank with high powered money, who then lends this excess in reserves to say a home owner or a business. The home owner/business owner deposits their new loan with say ANZ who then has an increase in deposits. Since ANZ is allowed to lend most of their deposits they issue a new loan to another home owner/business owner at a slightly lower amount than the first loan by the Commonwealth Bank. The process continues until the total increase in checkable deposits and loans in the banking sector is some multiple of the initial stimulus from the RBA. Could you please describe what will happen to the money supply if the fractional reserve money creation process operates in reverse? Assuming no major changes in the borrowing behaviour of the Australian Government, businesses and credit card holders, what would happen to GDP in Australia if Australian mortgage holders started paying off their mortgages at a similar rate to which they have been increasing their mortgages? Mishkin, F.S. 2009, The economics of Money, Banking & Financial Markets. Business School Edition, 2nd Ed, Addison-Wesley, Boston.